I used to really like the Punjab Eggplant variety of these Indian pouch meals from Trader Joe's. I have since stopped eating them after discovering how much sodium they have in them... yikes! This is my problem with label readers. They cost themselves a dining treat they enjoy because of labels. I long for the days when labels contained the product name and that's it. I hate scare tactic from the goverment and health gurus with these over exaggerated labels. Just eat and enjoy. Life is too short to read labels. If you base your life around what other people say you'll never enjoy anything ever. Everything is bad. Just eat and enjoy. Sheesh. i'm about to eat one of these things for dinner! They do indeed have a lot of salt/sodium, PM! 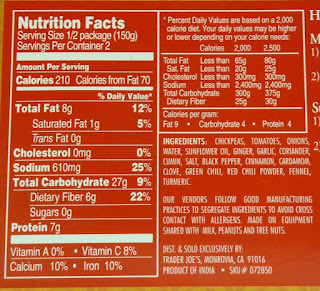 Must eat them in moderation...or not at all for those with high blood pressure, etc. Good point. I just stumbled across your blog. Scampering off to see if you've reviewed a few of my TJ faves. If not, I might ask if I can! 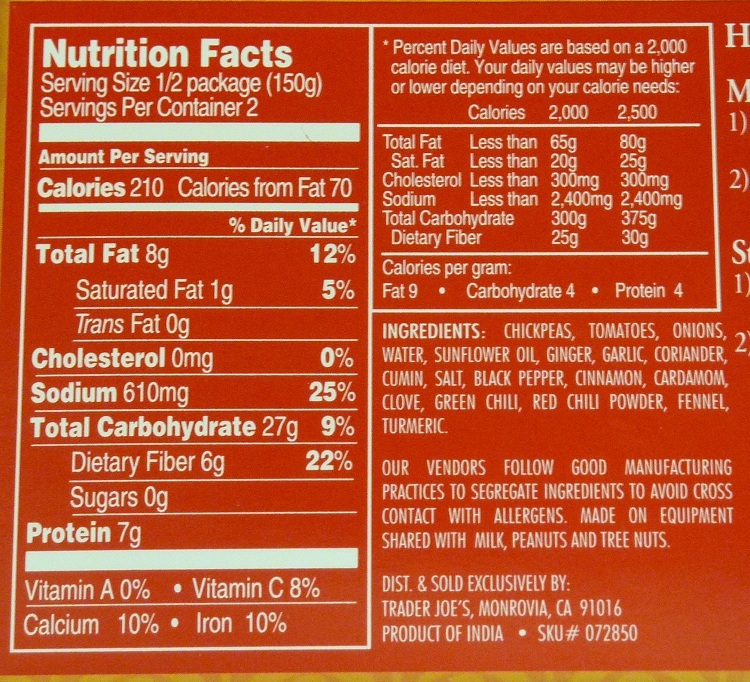 Trader Joe's Indian Fare Dal Makhani is my favorite, and for months, it is not in my store. It's the best of all the Indian Fare. Please, Trader Joe's, keep the best one! Everybody, check it out -- It's the package with the white swirl in the middle of the curry. I'll keep my eye out for the Dal Makhani, mjinaz! TJ discontinued this product more than a year ago! It was my favorite product in the entire store. I have tried over 10 other packaged Dal Makhani products both in envelopes like TJs and several frozen ones. None compare to Trader Joe's. I wrote to TJ and asked them to bring it back, but no luck. Please, please, please do what you can to get them to carry it again. Use extreme caution if you have acid reflux. I have kept mine under control for years. However, tonight I had punjab eggplant at about 6pm. When I went to bed at 1am, it all came rushing up to my throat. It was burning so bad and for so long, I thought I was gonna die. Mr. Joe, please test the acidity of your food, and protect the life and health of your customers. I goes well with lentils too! I love Punjab Choley as a taco filling. Just warm it, then mash it up. It goes great with cheese, lettuce, avocado and cilantro. I serve it every time we have surprised guests over because it serves 2- 4 people. Everyone loves it! I tell them to get it at TJ's. I'm selfish, I really serve it because I want to make sure the product sells well in the store, so they don't discontinue it, unfortunately, they just did! UGH! They discontinued it! Anyone know why? This was the highest protein content of their 4 veggie ones. Very disappointed in TC! I just surfed here looking for discussion of "discontinued Trader Joes Indian chickpeas" after going to 2 different TJ stores trying to find some. :-( Hopefully enough other people keep asking them to bring it back. I have some good news! 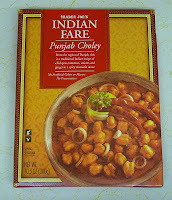 I tried Tasty Bite's Channa Masala and it is very similar to the discontinued TJs Punjab Choley. The recipe is slightly different (TB's is sweeter) but they are very similar in taste and preparation (same type of packaging). I actually suspect that Taste Bite is the manufacturer that TJs uses for their Indian food. 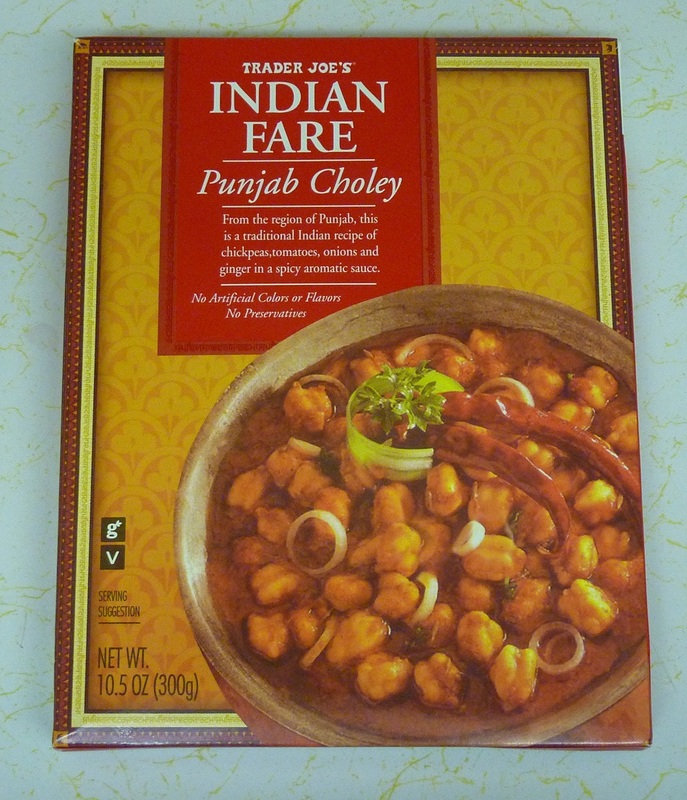 I also emailed TJs customer service to try to bring back the choley, but the TB channa masala is an excellent replacement. Please bring back the Punjabi Choley. Miss it and the other chick pea Indian products don't compare in flavor and health content.